Scoring a big-time playoff goal is right up there on almost every hockey player’s bucket list. Not only did Jake Neighbours get to check that box tonight, but he did so against his local team growing up. 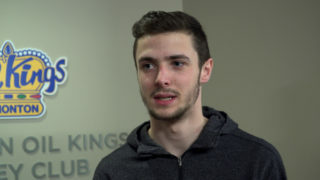 Neighbours scored his first career playoff goal with 13.3 seconds remaining in regulation to send the game to overtime, then potted the game winner just 3:20 into the extra frame as the Edmonton Oil Kings (5-2) rallied to a 3-2 win over the Calgary Hitmen (4-3-1) in front of 6,495 fans at Rogers Place on Saturday night. 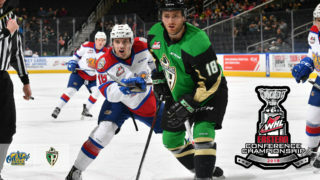 The Oil Kings lead the best-of-seven Eastern Conference Semi-Final playoff series, 1-0, with Game 2 set for tomorrow night, April 7 at 5:00 PM MT also at Rogers Place. 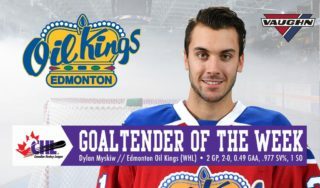 Dylan Myskiw (2-2-0) returned to the crease for the Oil Kings and earned the win, turning aside 20 shots. 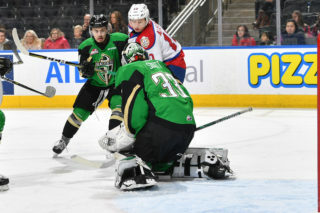 Jack McNaughton (4-1-3) suffered his third overtime loss of the playoffs after giving up both Oil Kings goals in the third period of regulation, followed by the game-clincher in overtime. He faced 34 shots, turning aside 31. After a scoreless first period, the Hitmen took a 1-0 lead on a 3-on-1 rush at exactly the midway mark of the game. Shots on goal favoured the Oil Kings, 11-9, in the first period of play and 22-17 after two. 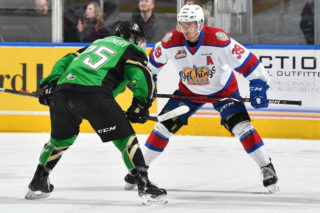 Just over seven minutes into the third with the Oil Kings shorthanded, the Hitmen extended their lead to 2-0 on a shot that deflected off a Calgary skate and past Myskiw at 7:09. But then the tables turned, as Parker Gavlas scored his first of the playoffs with a blast from the point that fooled McNaughton, assisted by Andrei Pavlenko and Conner McDonald to cut the deficit to 2-1 with just 4:03 left to play. 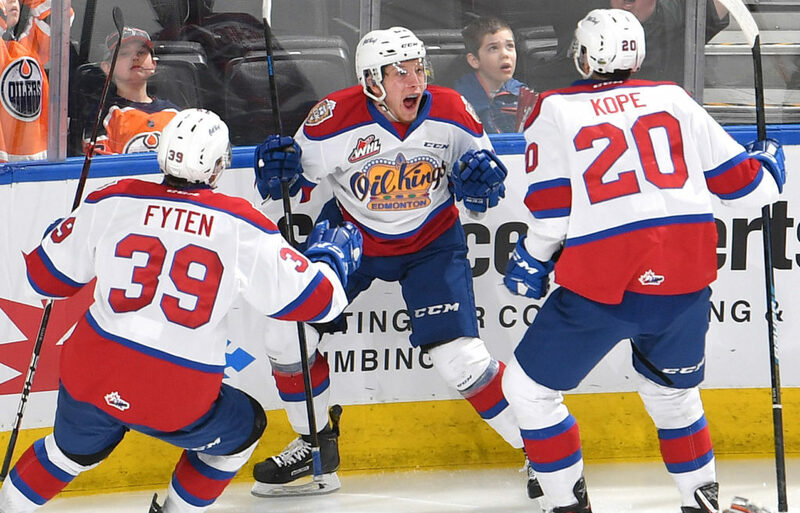 Then with just 13.3 seconds left on the clock, the Oil Kings gave their fans a reason to roar as Neighbours scored his first of the playoffs to tie the game, 2-2. Vince Loschiavo controlled the puck near the hashmarks then kicked it ahead to Neighbours, who sailed it past McNaughton at 19:47 with Quinn Benjafield earning the secondary assist. It was just 3:20 into overtime when Neighbours tallied his second of the night to end it, from David Kope and Andrew Fyten, and solidify the 3-2 comeback win. 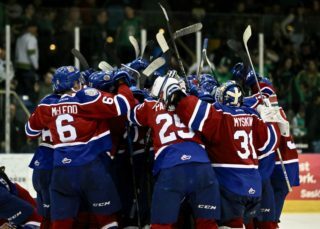 Shots on goal in the third period were 9-5, Edmonton and 3-0 Oil Kings in the overtime frame for a game-total of 34-22. Calgary was 1-for-4 on the power play, while Edmonton finished the game going 0-for-3 with the man advantage. Parker Gavlas (EDM) (3), Jack McNaughton (CGY) (2), and Jake Neighbours (EDM) (1) were selected as Three Stars of the Game.